After a nice time building forts, we went to Poulsbo for Mexican food at a great taqueria – which also happens to have a full bar. Good to know! The food was awesome and the people were really nice. 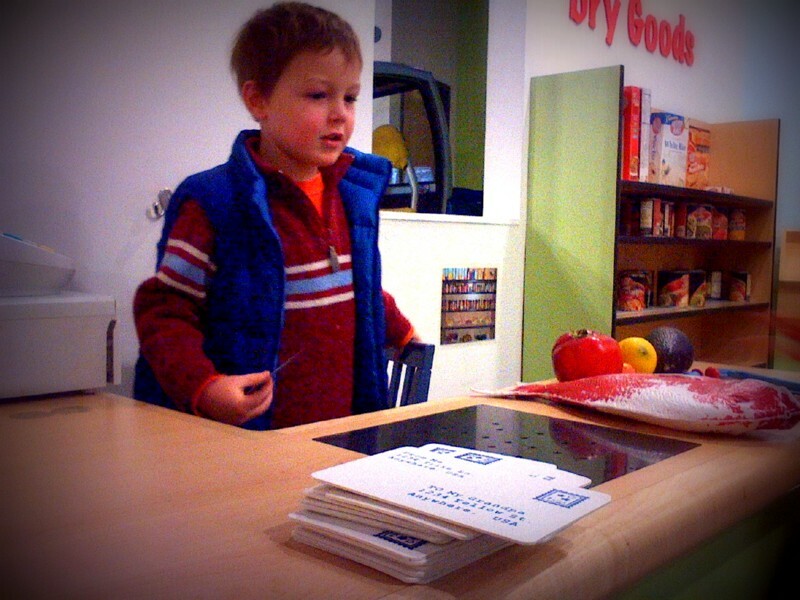 Then off to the land of malls and big stores – Silverdale – for redeeming Toys R Us gift cards! Yay! The boys had a great time looking over the offerings, and Ben was very sweet to say thank you when we finished checking out. He got a monster truck and a new electric guitar thanks to presents from Randy and Krissy, Dave’s parents and his great-grandmother. Sam got a Lego Technic set that he’d been eyeing, and model glue for the rocket his Uncle Steve got him. The jackhammer guy made me a bit overstimulated – just walking into Toys R Us is a bit of an event for me because I don’t tend to go into big stores much. 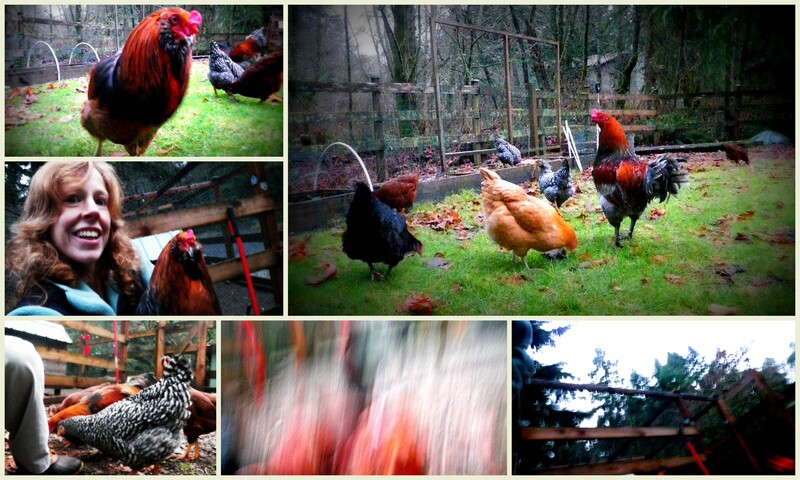 We made our way home and I stayed outside to give the chickens recess. 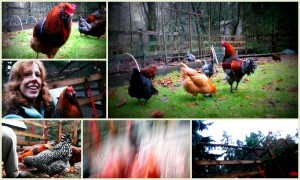 It was so nice to have it be clear, not raining, that I grabbed my camera and did some chicken family portraits. I did that last year over Thanksgiving, so we were overdue capturing who is part of the flock.It was such a nice, pleasant time in there with them, feeding corn, watching them scratch and take a dust bath. Toward the end (it was getting dark and they wanted to roost) they took an interest in my boot laces, which I thought was very sweet. Several came over to peck. I didn’t notice that Merlin had sauntered up because I was busy trying to squat down and take pictures at beak level. All of a sudden I saw him, and in a leap I tried to both get up and get back. I jolted out of my reverie so quickly that I fell backwards and tripped over the railroad ties around an old potato patch. I landed in the dirt and was just shocked at what was going on so I must have started screeching. By then Merlin WAS interested in me, even if he wasn’t before. He started advancing with an intent look. So I leaped up and tried to get away but slipped on and fell on my backside on a tarp-covered compost heap. I kept flailing as I tried to get up, all the while protecting my camera and trying to keep one foot out in defense against Merlin. By this time I was really screaming H E L P! (You know how you don’t know whether or not you’d really scream in an emergency or if just blankness would come forth? I guess I know now.) Dave, Sam and Ben all came running – very sweet that they all love me enough to come and see if I am ok. Dave was NOT amused that it was just a rooster issue, and this fact was exacerbated by my emergence from desperation and fear into the land of humor. I was starting to giggle. Then I started laughing so hard I couldn’t even tell them all what had happened! I was just cracking up – my world had changed so quickly from chicken garden nirvana to flailing and tumult. I was so disoriented! Hooray! It's Christmas! Wishing you and yours a very joyful holiday. Please click on pictures for the Christmas Eve and Day festivities. Click up one folder in the album to see the rest of December. 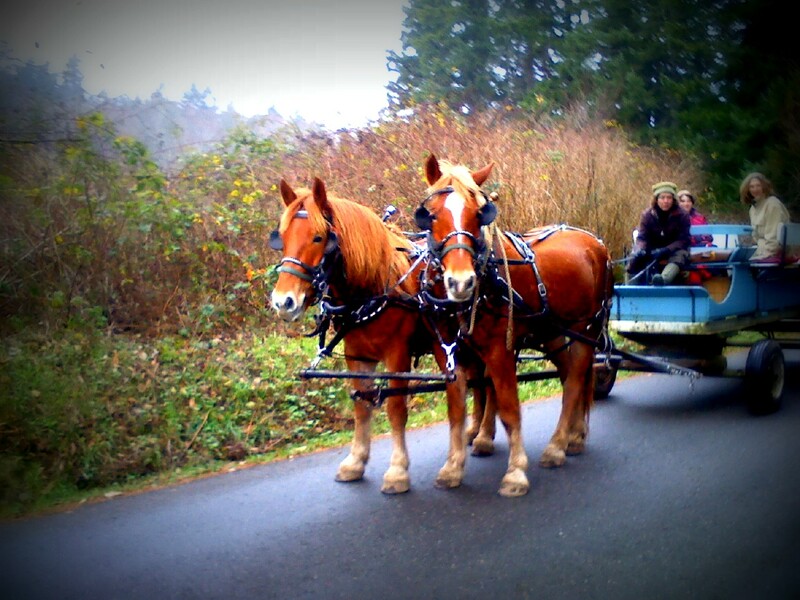 Riding in the wagon with Betsey and her friend Polly through Rolling Bay. I went a little off-hook today. I chased a “want” not a “need” – thanks, Mom, for allowing me to do that. We were busy making crazy green sticky Christmas cookies this afternoon when Dave asked me if I was expecting someone. “Huh? No?” I replied. Next I hear that there’s a woman with a questioning face wandering down the driveway. I raced out to find Betsey and her team pulling into the driveway! They were looking to turn around and wanted to know if I would like to go for a ride! I thought we were booked to go out to Chimacum and pick up Steve, so I said I couldn’t unfortunately. They came down the driveway and we watched in amazement, mom filming the whole time, while Betsey turned the team around. We were wondering what might happen if 3400 lbs of horse decided to do something crazy right next to Dave’s car, but we also were convinced that we didn’t give two hoots if the car got bashed to pieces. We were ready to buy him a new one. Somehow. We were just so amazed and awestruck to see Betsey and her team there. They stopped and chatted after pulling two k turns. Abby pooped and that sealed the deal – the best Christmas present ever is still out there steaming on the gravel! I don’t want to scoop it up! Dave and the boys came out to see the commotion as Mom and I wiped tears of joy at seeing horses on the property. It has been SO many years and I still miss them so much. Well, try as I might, I couldn’t go on with my afternoon as planned. I finished up the cookies and decided I was going to race down and catch up with Betsey and Polly. So I carried two cookies, a sparkling water and a Christmas card to mail at the little Post office down by Bay Hay. I ran down Kallgren, knowing I’d run into them somewhere along the way. People must have thought I was a little kooky racing around in jeans, boots, cookies, can of sparkling. But I caught them and enjoyed a couple (cold, wet) hours riding in a wagon. I swear I felt like a celebrity sitting there with them. They use a wooden pointer hand to signal which way they turn – so Polly and I took turns pointing the finger so we could turn. Some cars are very courteous and go by slowly, others race. One horse, Abby, is tentative and nervous. She sweat a lot. Her half-sister, Red, is calmer and confident. 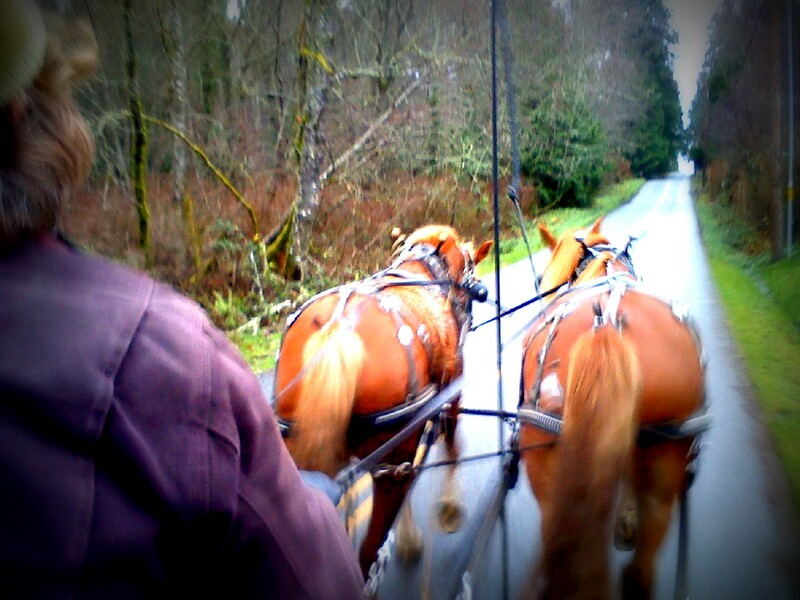 We had to scramble to pick up poop out of a church parking lot – still makes we wonder a little when a slice of old Bainbridge comes rolling through – gorgeous team of horses and committed farmer – that we even THINK about commenting on poop in a parking lot. So Polly and I borrowed a shovel and did our best to get rid of it. I guess we need to get Betsey a travel pail and tiny shovel in case it happens again. Out walking through the local farms with Uncle Steve, giving him a tour. This brief moment of sunlight was beautiful! – trying to charge into their stall without waiting for her command. Driving a team is serious business – they are enormous and must listen to Betsey’s every command or someone could get very hurt. She says “whoa!” to stop, “step gee” and “step haw” for turns (R and L). I think I got that right. I need to watch and learn a lot more. 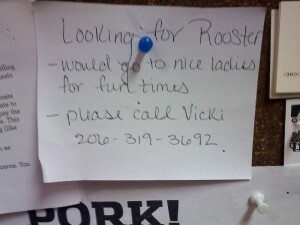 Betsey finally has my # in her cell phone so she can call when she needs help mucking. I will run over in a flash! It’s a little hard to spring free with a 4 and 7 yr old around, and a Dad who has been working so much, but thankfully I could do so today and this brief time unhooked from my life, while hooked up with the team, really made an impression. I am sorry, Dave, but more livestock will be coming to our lives, somehow. I haven’t even shared yet my experience sharing breath with a llama, Zorro at Adrienne’s Rolling Bay Farm. Wow – he sniffed my breath to get to know me! That was so intense!!! I saw little (big!) lower teeth and said a quick prayer that all he wanted to do was sniff! He got within a centimeter of my face, drank in my own breath, then leaned his long neck back and his dark, deep eyes went wide as he seemed to process my breath. Thanks to Adrienne and Betsey for a couple very memorable days! Uncle Steve is here! 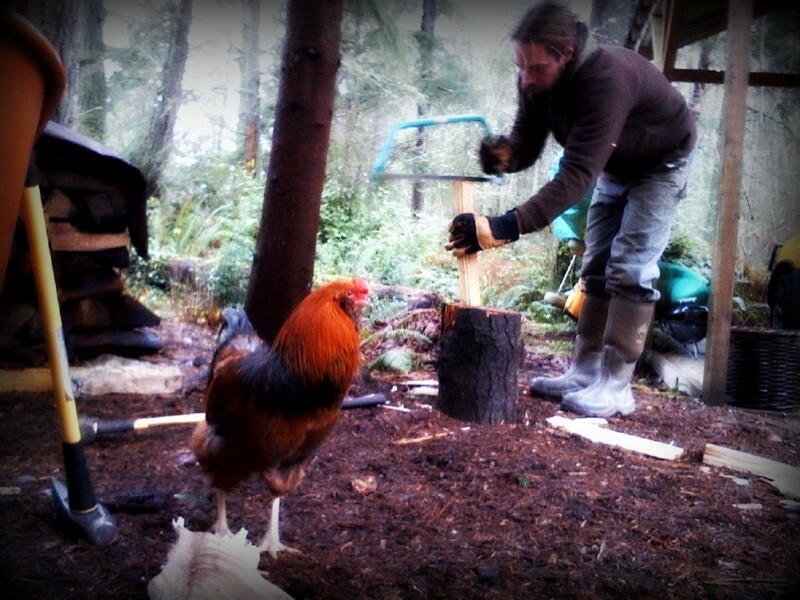 He is already busy chopping wood and making a kindling bin from wood he planed himself. He seems to like Gordon well enough, and Gordon was smart enough to stay away from the axe 🙂 Ben is LOVING having someone with as much energy as he has - so much romping and wrestling! Little Ben keeping Steve company and enjoying a visit with Gordon. So cute! While out on a jog I ran into farmer Betsy and her team, Abby and Red. So neat to see them out! They hope to take neighbors around caroling this month. And Sam has created a personal record domino wall that he shot down yesterday with a nerf gun. It took several attempts to destroy it. This is a compilation of clips and gives you a good sense of the typical afternoon here 🙂 Enjoy! It was Dave's birthday on Wednesday. 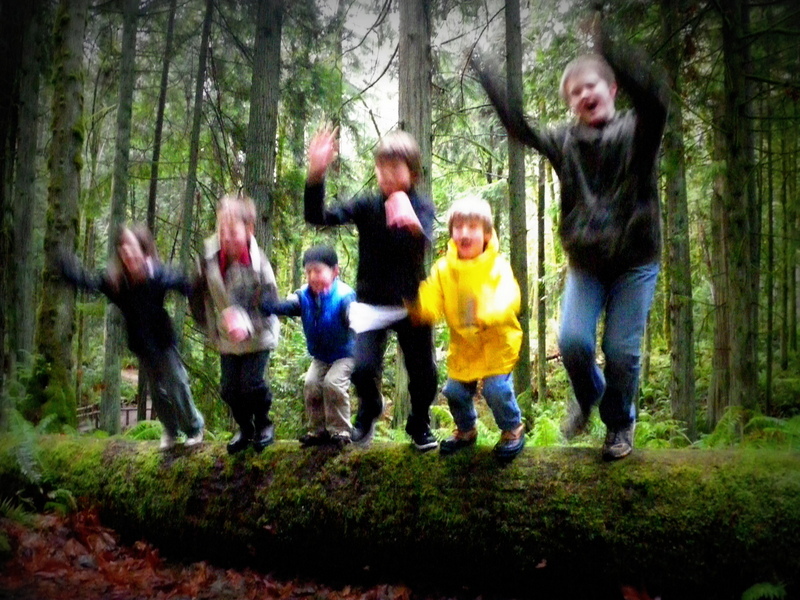 A few days earlier, the boys and I started making a list of character traits Daddy shows us. This is what the boys came up with (mostly Sam, of course). It was part of a present we gave him. Since he is working so much, it was important to me (less so to him, probably!) that the boys connect with him on their Daddy's bday. I think Dave would have preferred getting something "REAL" on his bday, from his wish list. But he tends to buy those things for himself so I went a different, rogue, direction. They also got a funny card for their daddy and gave it to him in the morning. On the right side of the board you can see our goals for each day - we get a star if we manage to work in these things. 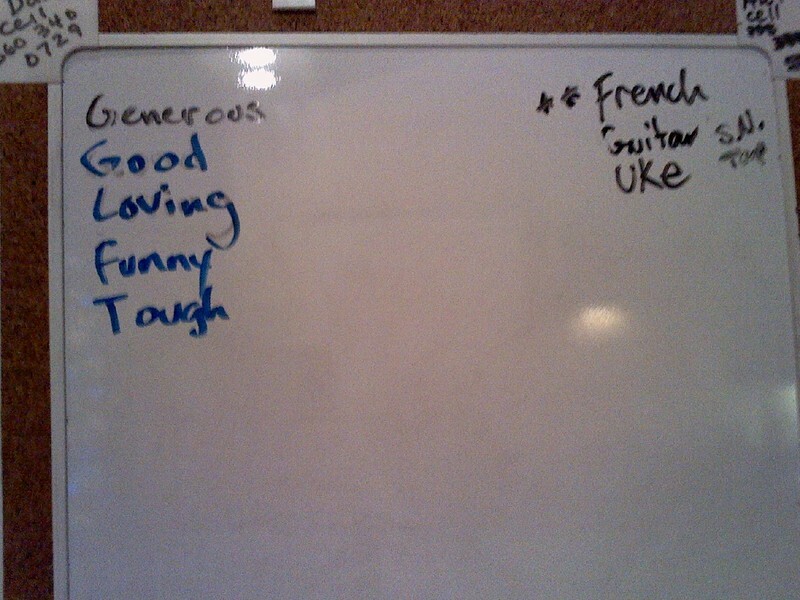 French is for me, guitar for Sam, uke for Ben. Sam is also learning German now. We've got 3 language learning endeavors going on at home right now! 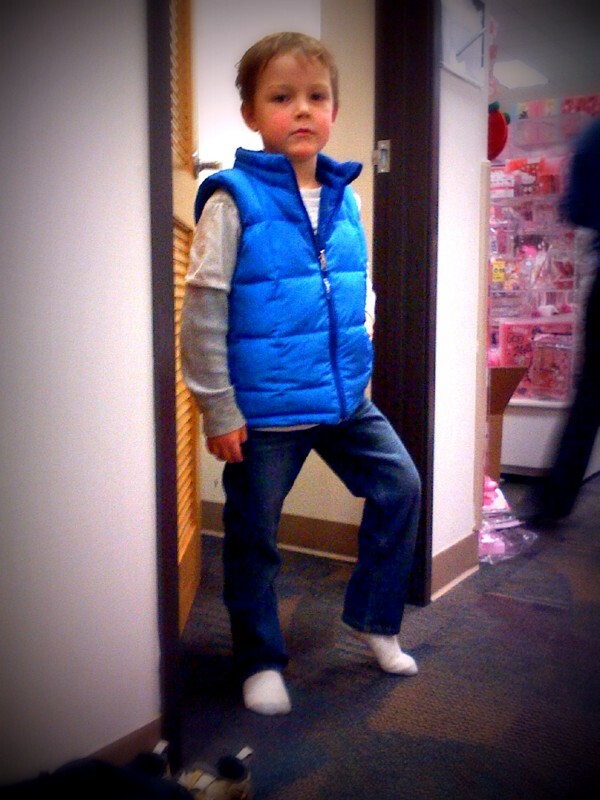 Tuesday - Finally broke down and bought NEW jeans for both boys, at the Exchange on base. Not cheap! But we had a great time shopping. Ben loves to model, and pop in and out of his own dressing room "I'm in my little house, mom!" "How are you guys out there?" "Doin' alright?" It was such a pleasant shopping experience. I could leave the kids and run to get a different size without worrying. That is not possible at WalMart or anywhere else, really. 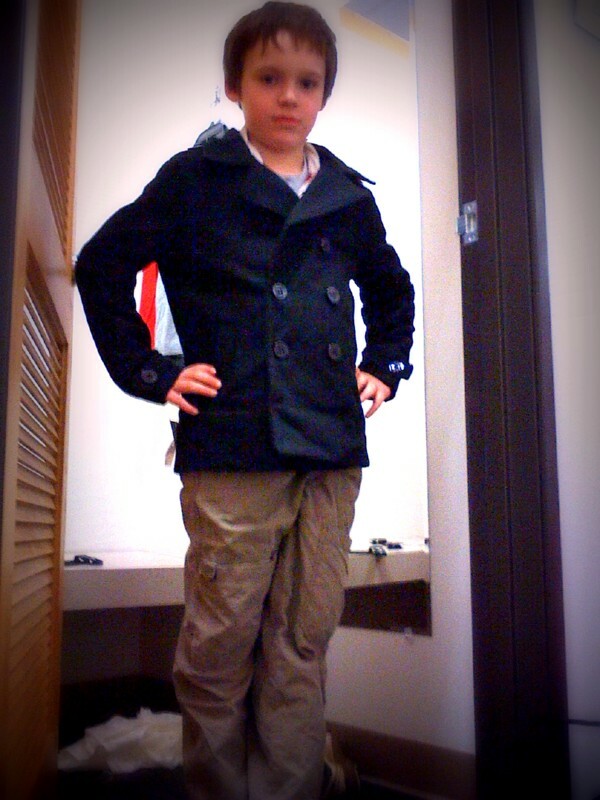 Sam trying on a pea coat. 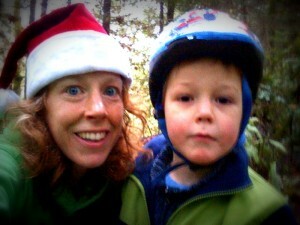 He really liked this one...we'll be back (or maybe Santa will!). Ben loves to go to KiDiMu (kids' museum in town) on first Thursdays (free!). 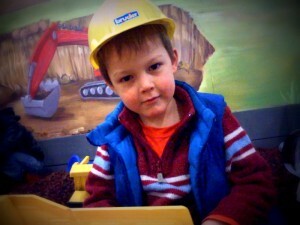 Here he is digging and filling big dumpers. And at the cash register checking me out. He did a BEEEP for every item crossing the scanner. So cute! Sweet boy and I having fun. Like my attire? Red HO HO HO hat, green sweatshirt with Lanikai Beach in red and white lettering. 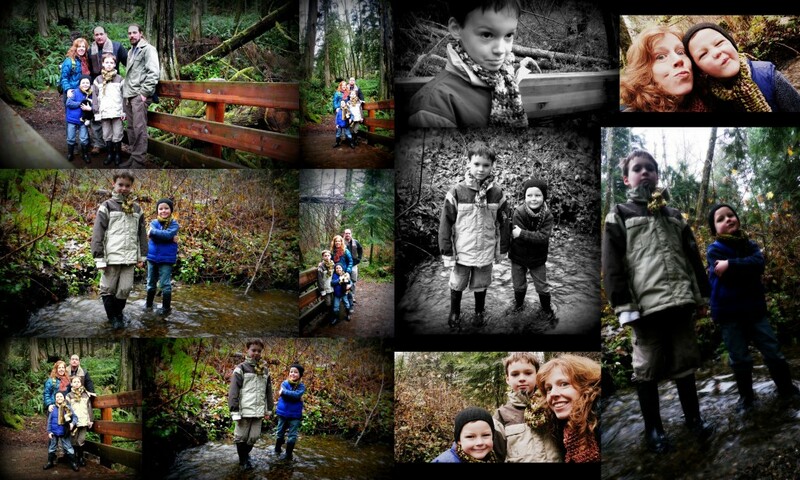 I try to run around Bainbridge and add some color. Then I saw a sign saying "Grand Forest is populated by Barred Owls. They are aggressive and attack people. Be careful." HUH? How do you prevent against a Barred Owl attack? Then I wondered if my outfit would help or hinder in that. I had no ready answer. I went home and checked on the chickens – little peep girl with the broken leg is FINE fine fine! Can you believe it? 3 weeks of separate living and ensuring good food and water and she doesn’t even have a limp. Amazing. She is still catching up on size, though. When I went in to spread around some scratch and tidy up, I found that Merlin was particularly interested in my doings. He came over, acted menacing (beak to ground, pretending to peck but really giving me a hairy eyeball and scooting toward me). He followed me and even flew up on the door to stare me down from my height. That is spooky. This guy has some SPURS now. I was cautious but didn’t act scared. Eventually I talked him into leaving. I found an egg that Goose had laid – huge! She is our baby girl hatched by Jersey in the spring and she just started laying this week. So exciting! Blue eggs with a touch of olive green. VERY large eggs when she takes a day or two off between eggs. Anyway, back to Merlin. He kept looking and looking at me, threatening me. I finally realized that it was my Santa hat – it looked like – you guessed it – a BIG ROOSTER COMB to him! I just laughed out loud. People walking must think I am a real nut case! Which would be true. Then back inside to work on a 90 page thesis. That is the week in review. On Wed add to the mix getting up at 5:15 am to swim, then observe a math program at school, then to a meeting at the district office (with Ben). 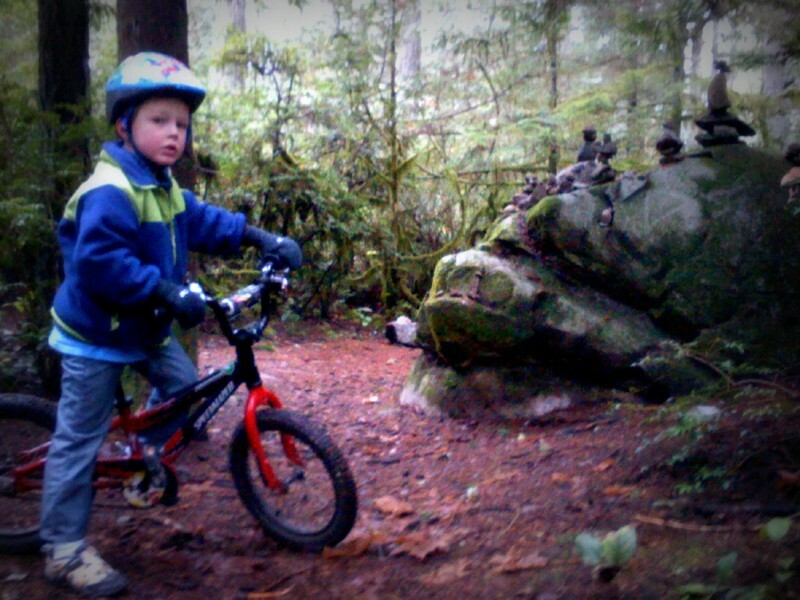 Out mountain biking with mommy! We had a couple dry days (grey, but dry at least!) so we hit the trail. He gets unnerved a bit if it has been a long time, so we work on how to manage fear and frustration while having a good time and laughing. 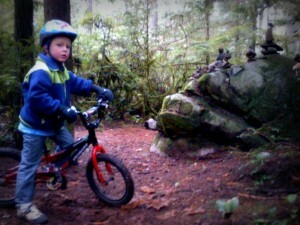 He did not like it when I tried to ride his bike downhill "Mom! You're going to break it!" It was pretty funny - me trying to brake on that tiny bike! I was skidding all over. Last night we got some lights put up so the tree is looking less like a hulking form dominating the entire living room! It is so pretty. We love it! 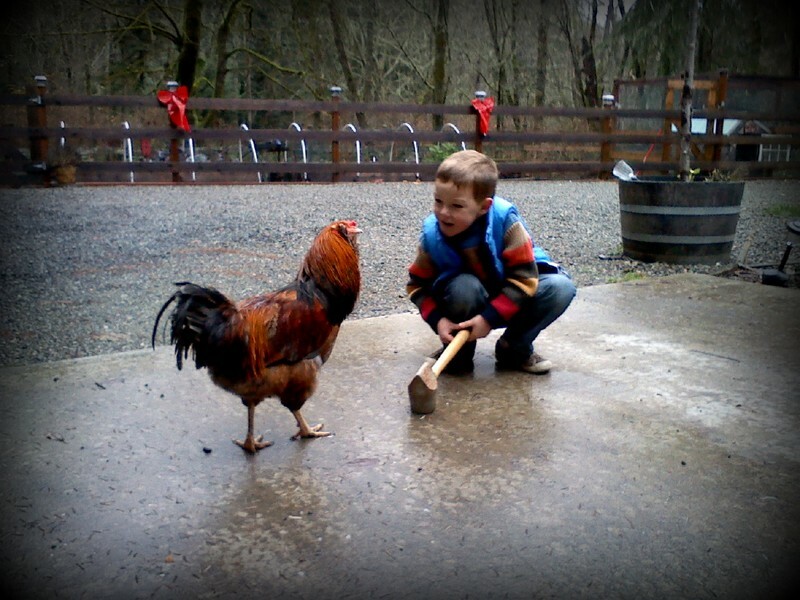 Ben had a little friend over this morning to check out the chickens and also see the huge tree. This is little Ruby playing with some Christmas things. He is very gentle with her (she is 2 this weekend). On the way out he held her hand down the stairs in front. How very very sweet. I almost cried! 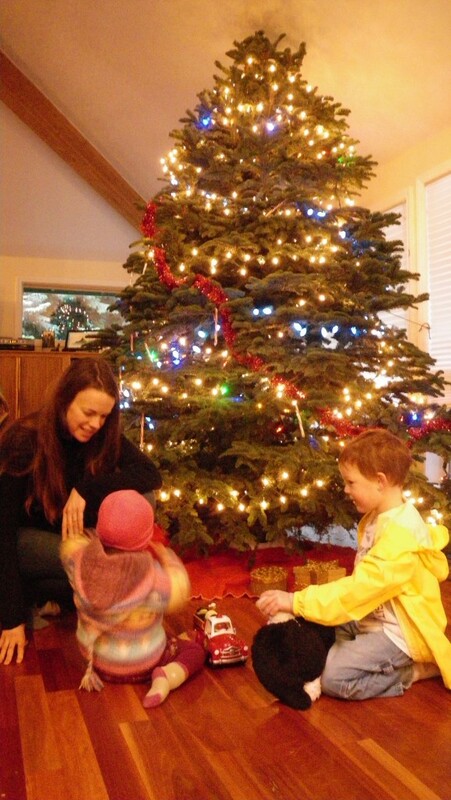 Ben and Ruby, with mom Lauren, enjoying a few minutes of Christmas cheer this morning. 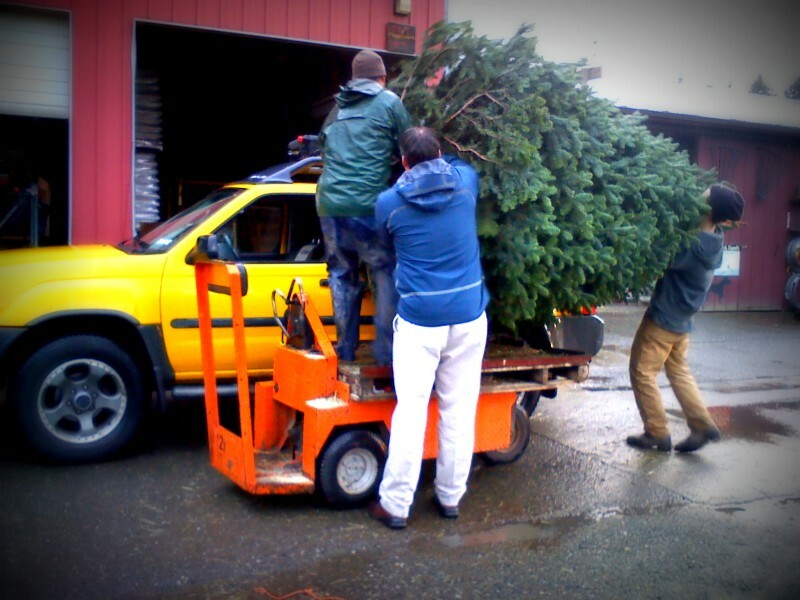 Dave suggested we get the biggest tree on the lot! After looking at it, some pondering - what in the world are we thinking - should we do this? what if we can't get it in the house? We decided to go ALL IN and just get it, figure the rest out later. I thought it could go outside at the very least. Well - it's IN the house! It's monstrous! I am working on how to create a siphon so I can water it more easily. 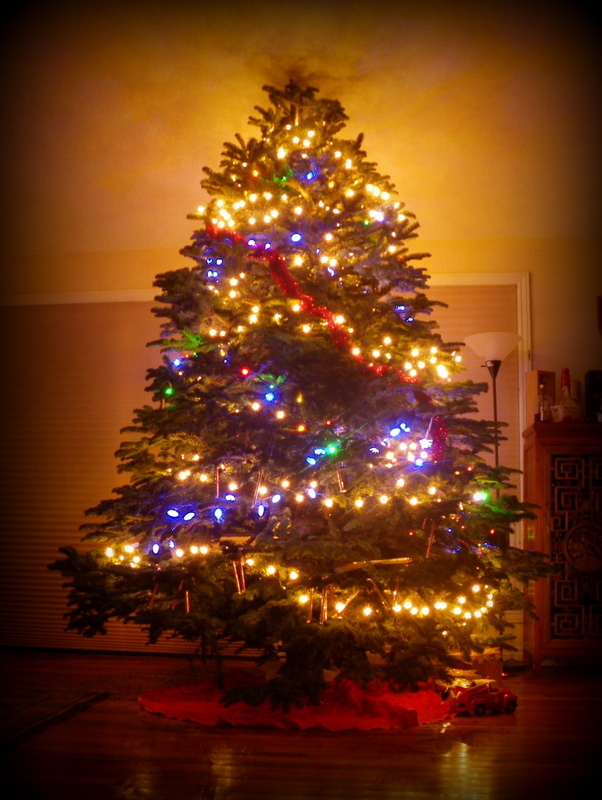 We had to get a bigger base, too, because this 9 foot + tree is about 200 lbs. Dave got it into the house single-handedly. My mom can attest - my husband is one strong guy. She likes to watch him manhandle kayaks at Lake Crescent. He makes things look so easy. I was helpful with standing the tree up without scratching the wood floors. And if I pull off the siphon trick without flooding the house, he might be mildly impressed. If the tree has a diameter of 7" what is the circumference??? Our Saturday - Dave went to work early, I made pancakes ("Light, mom, like Dad's. Not dark. Ok?") and then I did some volunteer work for the schools, then we went for a hike in the rain and wrapped up by hitting the market. Here is a roundup of the day. I think this is the rainiest winter in 118 years? I read that a few weeks ago when it was only October. Here’s hoping it turns into snow soon! I’d much rather have that. The “puddles” here are just unbelievable. They rival the best puddles we found in Hawaii. There is less good muddin’ though – it is just kinda frowned upon. And I find that I am either more prissy, or I just don’t like being both wet AND cold, but I’m not pushing strollers through mud with Sam on a mountain bike going through a massive “lake” here like I did in Hawaii. Have I lost my grit? I didn’t think so – we do other nutty things. But maybe I have? 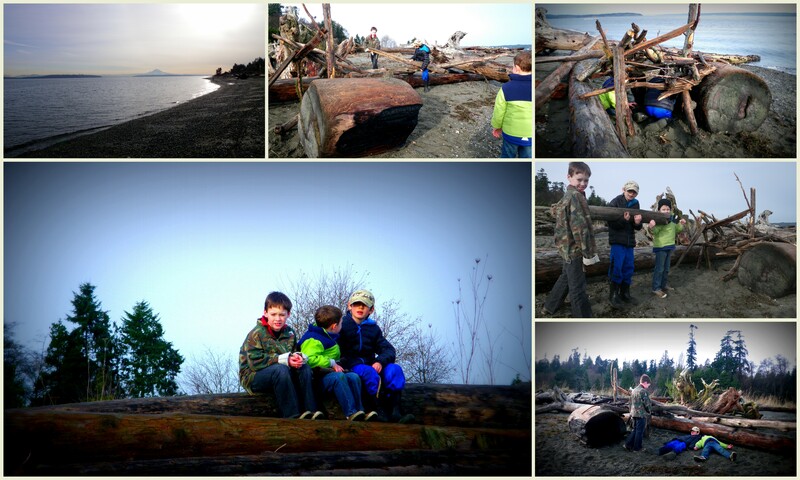 Yesterday we were on an outing with one of Sam’s friends in Battle Point Park. It got very wet, very quickly. As we started walking around, it started just pouring. 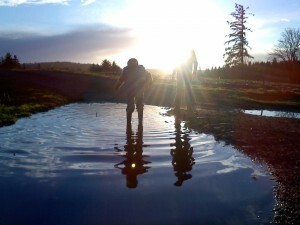 Sam and his buddy had a great time walking through a “puddle” that was 2 1/2 feet deep – truly. They traipsed all over with guns and cammo (in the near-dark – it is black out at 5pm) with me, the other mom, her dog and little Ben all in tow. 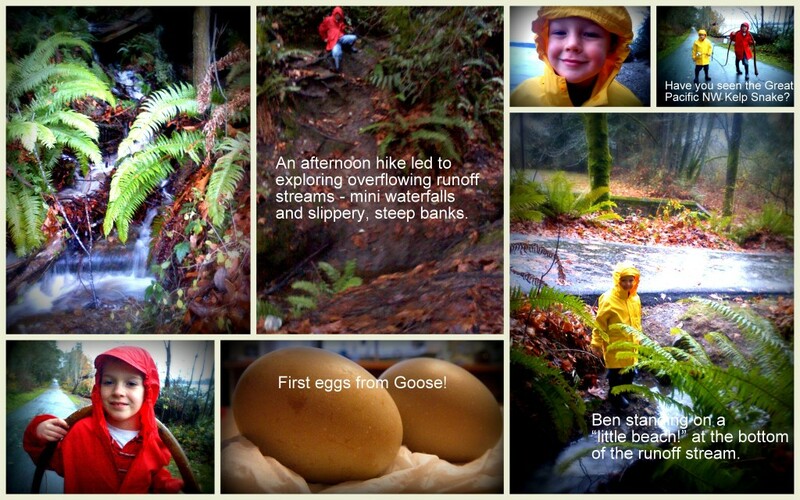 Ben was such a trooper – he has a neurosis about wet pants. He wants to change clothes if his pants get wet walking home from school after dropping Sam off. So to trudge all over in the pouring rain – he was a strong guy. I wasn’t thrilled – I was cold to begin with. I didn’t know this is what we were doing so I wasn’t dressed for it. Tamara knows if there is anything I don’t like, it’s not being properly prepared, gear-wise. When we went sliding down playground slides on Lego bin lids (in the rain – for speed) we had trash bags on our butts (like knickers) and helmets on. Have you ever SHOT off a slide on a Lego bin lid? I still remember watching Tamara do it! She really flew! Anyway – when we finally got back home we were all soaked. I managed to go down in a big puddle after deciding – what the heck, I’ll just RUN through this one (because Sam said it was fun)! I forgot my Muck boots have zero tread. I went totally flying and landed on my rear. By then it was laugh or cry – so the choice was clear, it was pretty funny! Sam and his buddy thought so, too. Ben was silent on the matter. I was invited to write a column on chickens – Coop Scoop – for a local magazine (InsideBainbridge.com). Here is the first article. The next one is on…you guessed it…sick and injured birds. I’m invited to include some humor – so it could get interesting. I have plenty of VERY funny chicken friends to draw on, too.